Thank you again for giving freely of your time and volunteering for the Superior Spring Trail Race on Saturday May 20th, 2017 – This email is a quite lengthy, but doing the job safely and correctly is very important to the success of the race so thanks in advance for taking the time to read through this in its entirety! We have a lot of excited runners and the trails are in great shape – we are looking forward to a fun weekend with all 115 of our awesome volunteers! 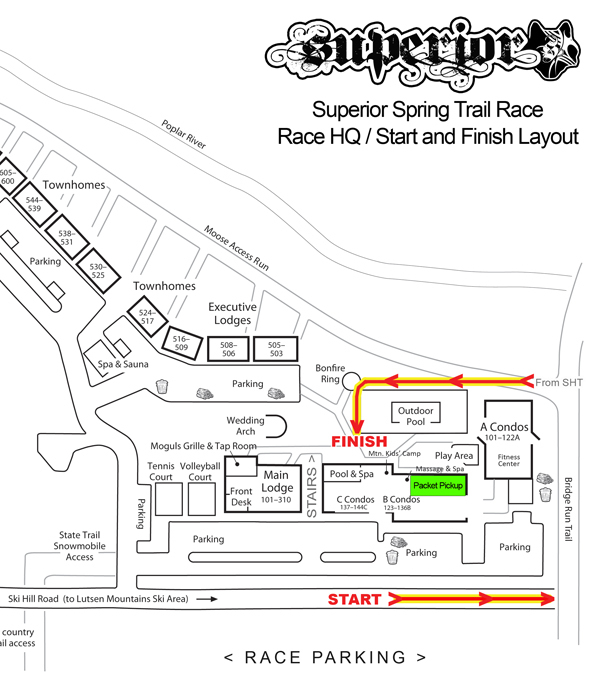 Volunteer Assignments have been made and are available HERE https://www.superiorspringtrailrace.com/volunteer-assignments/ – if you see something that does not work for you, please let us know right away. You can search the list by volunteer position or by last name – be sure to do both as many of you are assigned to more than one position. Most of the volunteer assignments are pretty straightforward but you can find job descriptions and directions on how to get to where you need to be https://www.superiorspringtrailrace.com/volunteer-jobs/ along with what equipment and food your aid station will be provided https://www.superiorspringtrailrace.com/aid-station-supplies/ and even how to work an aid station https://www.superiorspringtrailrace.com/aid-stations-101/. Also be sure to read up on all the race info on the website especially that which is under the Race Info section so you have the best possible sense of what is going on at the race and can be a good resource for runners, spectators and other volunteers. We have really good coverage for race weekend but If anyone that does not work on Monday wants to help us clean-up at our home in Hastings, we would not turn you down! We have Chalayne Palmgren coordinating our medical team and Minneapolis Doctor Dimitri Drekonja will join up after he runs the 50KM race. We also have some EMTs and other medical people out on course working at the aid stations in the ‘notes’ section people are called out if they have some medical training. As always, if there is an emergency, we want to get the HAM Radio Operators involved right away who will in turn get Chalayne and Dimitri involved. If it is something very minor, one of the medical people at the aid stations may be able to assist, if it is a bit more serious the HAMS will call to the finish and get in touch with Chalayne and / or Dimitri for some direction and if it is a true emergency, the HAMS will call for Cook County emergency services to be dispatched. Our fantastic Ham Radio volunteers may need a little help during the busy times writing down runners numbers – if your aid station is well staffed (which they both look to be) and you have a free person, please feel free to offer (or they may ask) – if they don’t need you that is fine to. It is very important that since this race is on the edge of some remote country that we account for the whereabouts of runners at all times. This will entail sitting at a table and writing down the bib numbers of runners as they come through. If a runner DNFs make sure their number is reported to the HAMS and that you take possession of their chip (they can remove it from the bib) so they can call it in – aid station captains and HAM Radio folks please coordinate this! We need to have two volunteers where the Superior Hiking Trail crosses Sawbill Trail / Cook County 2 – we will have two people with vests and flags stationed here and signage on the road on each side of the crossing – although this road does not get a ton of traffic, this is a fairly high speed road so this is very important. We will also position two people at the top of Onion River Road where it dumps into the Oberg parking lot since right at this intersection, the Superior Hiking Trail comes in and it is always a chaotic mix of cars entering the lot at low speed and runners – these flaggers will help keep order at this intersection and in the parking lot where the aid station is also located – aid station volunteers please offer to relieve these assigned individuals from time to time so they can get a short break – use the restroom, eat etc. NEW – Name badges on lanyards. In the aid station bins will be lanyards with name badge holders and magic markers to write down your name on the card (both sides) and insert into the holder. Bare with me – I know not everyone loves name tags but just as we have found with the runners (and having their names printed on their bibs) we have found 1.) we meet so many people on race weekend that it is hard to remember everyones name and 2.) knowing peoples names and truly getting to know people facilitates the sense of community – please if you will, participate! Those that indicated that they need lodging will want to read up HERE https://www.superiorspringtrailrace.com/volunteer-lodging/. Our units are going to be 504, 505, 509, 510 a Caribou Highlands site map can be found HERE. Room assignments will be displayed on the sheets attached to the doors of each unit – you can go to any unit to learn which unit you will be staying in. If you are not comfortable with the arrangements there are other good lodging options right a Caribou Highlands and camping options available in the area. Bring a sleeping bag, pillow and towel. Do not leave valuables in the units since we do not lock the doors so everyone can get in at all times – if you are away be sure to bring valuables with you, lock them in the car etc. ***IF YOU NEED A PLACE TO STAY AND HAVE NOT YET INDICATED TO US, PLEASE FOLLOW THIS LINK HERE https://goo.gl/forms/Re0Sl4S2PDd9MiFm1 AND LET US KNOW WHICH NIGHTS (FRI & SAT) – Thursday night we will have a place for the trail markers and those helping with setup on Friday as well. Those who are marking trails should plan to meet at Caribou Highlands town home unit 505 at 7:30AM on Friday May 19th, ready for a 8:00AM Departure. Make sure you have enough food, water, clothing etc. to be comfortable on the trail. *** We are using different trail markers than in years past so please bring a pair of light work gloves for marking. If you are assigned at an aid station we will send your volunteer shirts out to you – we will also send out a bagged lunch with a sandwich, chips and cookie. If you are assigned elsewhere, your shirt will be at the finish line area / race headquarters and you can eat chili at the post race meal / anytime after 11:30 AM – those at the aid stations are welcome and encouraged to come to the finish after their aid station closes to eat as well and visit (or even come help cleanup!). If for some reason you do not get your shirt, please do not be shy and ask for it! Thanks!This is likely the last email we will send out to volunteers this year… as always should you have any questions please contact us. We are looking forward to seeing everyone for another successful race!